If you want to acquire more customers and grow your local business in 2018, you’ll need to know some stuff. In this comprehensive post, we’ll explore the local business Internet marketing strategies that you'll need to succeed in 2018 and beyond. Ok, so I know I said we’d dive right in, but let’s make sure we’re on the same page first. With so many different terms out there, it gets confusing. Internet marketing, SEO, PPC, digital marketing, content marketing, search engine marketing, organic traffic, paid traffic….are just some of the terms that get thrown around. We’ll work to break all of this down as we go, but to get things rolling, we’ll start with ‘Internet Marketing’. A simple but accurate definition of Internet Marketing is: Leveraging tools and functionality available over the Internet to achieve business goals. So in essence, Internet marketing encompasses any marketing activity that takes place on the Internet. To keep things simple, at StayDigital, we define Internet marketing, online marketing, and digital marketing in the same way. So when we use any of these terms, we’re talking about marketing activity on the Internet. The opposite of online marketing is offline marketing. This encompasses the more traditional methods that people think of including TV, radio, and print advertising. Technically, digital marketing can cross over into the offline space (think digital billboards and signs), but given that the vast majority of digital marketing for small and local businesses takes place on the Internet, we think it makes sense to keep it simple. Is Digital Marketing Better Than Offline Marketing? It’s a question that most small business owners need to know. With limited budget and resources, where should the focus be? The majority of the time, digital marketing is going to deliver better returns for your local business. That’s because online marketing has some significant advantages over more traditional forms of marketing like TV and radio. Measuring the outcomes of an offline campaign can be difficult and often times inaccurate. However, measuring the performance of an online campaign is relatively straightforward. Producing a TV or radio ad can result in significant investment before the campaign is even launched. Digital campaigns can be launched with relative ease and minimal investment. When you launch a traditional media campaign, you’ll usually be limited to targeting an audience in a specific region. With a digital marketing campaign, you can target an audience based on a variety of demographic and behavioural factors to make sure you’re reaching the right people. With offline marketing, people can’t interact with your content. But when users are online, they’ll be able to interact with your content and become engaged with your business. If you want to reach a large number of people in your target market, traditional media just can’t compete. Digital marketing can reach more people at a fraction of the cost of offline methods. Although offline marketing can work for some businesses, digital marketing strategies will generally allow local businesses with limited budgets to achieve their desired results at a lower overall cost. There are a few huge companies out there that dominate the Internet today. I’m talking about Google, Facebook, and Youtube. About 68% of all online users search using Google, and Facebook attracts about 70% of all active web users. And we all know how much time people spend watching Youtube videos! 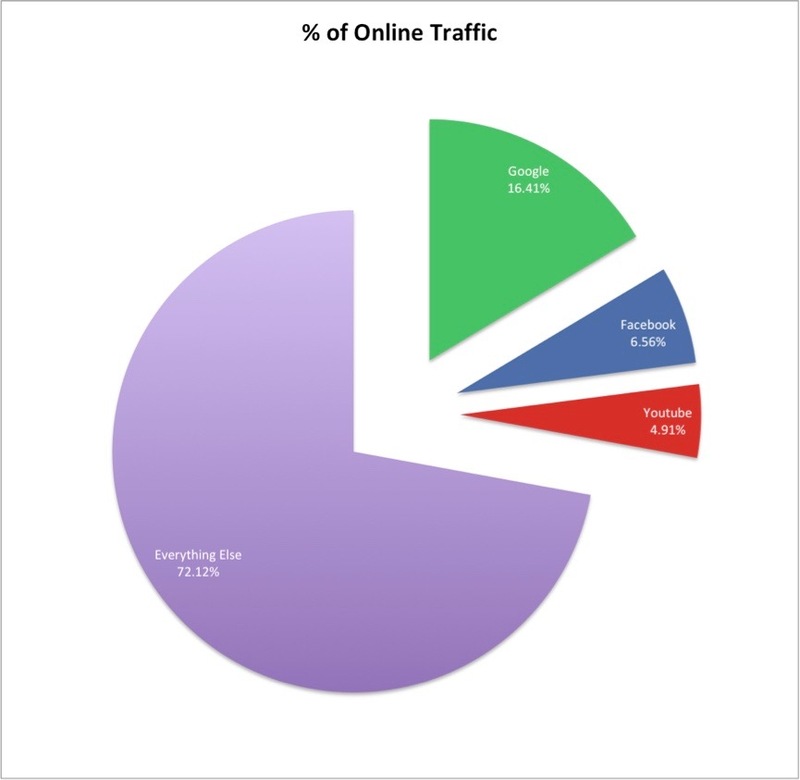 The chart below shows the share of online traffic in the US to these three websites. So that’s 3 websites owning over 27% of all online traffic! To understand how to succeed using digital marketing strategies, you have to first understand the business models of these behemoths. First and foremost, these online giants provide a service that people love to use. Google delivers answers to our questions at the speed of light. Facebook connects you with your family and friends. Youtube provides videos to educate and amuse us. Their primary focus is to deliver content that connects with their users. By focusing on this core objective, they’ve created billions of loyal followers that come back nearly every day to use their services. With billions of eyeballs consuming their content, they’re able to generate huge sums of money with advertising. In 2008, when they launched their advertising platform, Facebook’s revenue was $272 million. In 2017, it was over $40 billion! Up nearly 15,000%! The most important thing to remember is that relevant content is king! It’s the relevant content that keeps their users coming back for more. Now that we know what Internet marketing is and how the major content providers out there work, let’s dig a bit deeper. There are two broad forms of Internet marketing. When you pay a content provider (Google, Facebook, YouTube…) to show your ad or other content to prospective customers. When you’re content is delivered to prospective customers at no direct cost to you. Let’s take Google as an example. 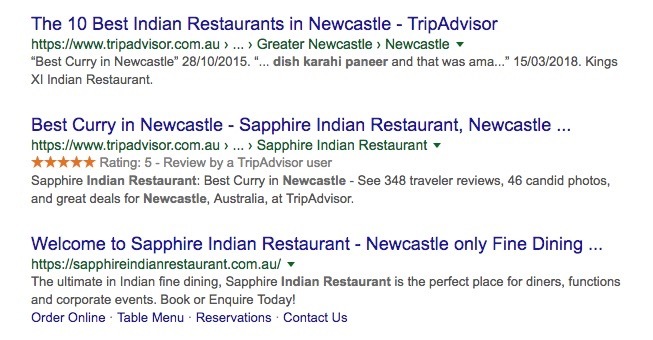 When users enter a search query into Google for Newcastle plumbers, a list of results appears. Results that companies are not paying for are called organic results. With Facebook, their paid and unpaid content can show up in someone’s news feed, Facebook messenger, sidebars, as well as outside of Facebook. So delivering your content to your target market can take two forms. Now that we understand the two broad forms of Internet marketing, we can dive into the key digital marketing strategies that local businesses can implement. Most large online content providers have some form of advertising services that businesses can take advantage of. Whether it’s to display an ad on their website or display your information to people looking for a service. There are many opportunities for small businesses to leverage paid advertising. Let’s have a look at some of the most common paid digital marketing strategies that local small businesses can take advantage of. Google Ads is the new name of what was formerly known as Google Adwords. They changed their name in July 2018 to more closely represent their product offerings. As a platform that previously focused on the words people typed into their search engine, the platform has evolved to become an expansive online marketing platform. Text based ads that look like their organic search results (what most people know as Adwords). Image and text based ads that appear across a number of partner websites. These are the ones that appear to follow you around the Internet after you’ve visited a website. Video based ads appear on video platforms like Youtube. Ecommerce ads that allow users to easily compare products from different suppliers directly in the search results. Ads designed to drive your mobile app installs across Google’s partner networks. This has been around a long time and is one of the first places most local businesses should focus their paid digital marketing efforts. Google Search Ads are a form of Pay-Per-Click (PPC) advertising, which means you’re only charged if somebody actually clicks on your ad. Google automatically measures all of the important metrics so you can make smart decisions about your ad spend. Let’s have a look at Google Search Ads in action. We’ll use the scenario of somebody looking for plumbing services in Newcastle. Google will take that search query and return the most relevant results within its Google Ads platform. Google determines which ads are eligible to appear for the particular search query. They then assess the quality of the ad as well as how much the advertiser is willing to pay for a click to determine which ad shows up first. Generally, the higher up the search results your ad appears, the more likely somebody is to click on it. 1) Has a limited budget to spend on PPC advertising. This is because Google Search Ads generally result in strong direct conversions. People searching for your particular product or service are likely closer to making a purchasing decision. 2) Provides an ‘emergency’ product or service. Businesses that provide services on an as-needed basis (like plumbers, electricians, dentists…) should appear when users are searching for them. If you want people to remember your brand and keep your product or service top of mind, Google Display Ads are an effective tool. You can create ads that show up across the Google Display Network, a network of over 2 million websites that reaches over 90% of all Internet users. 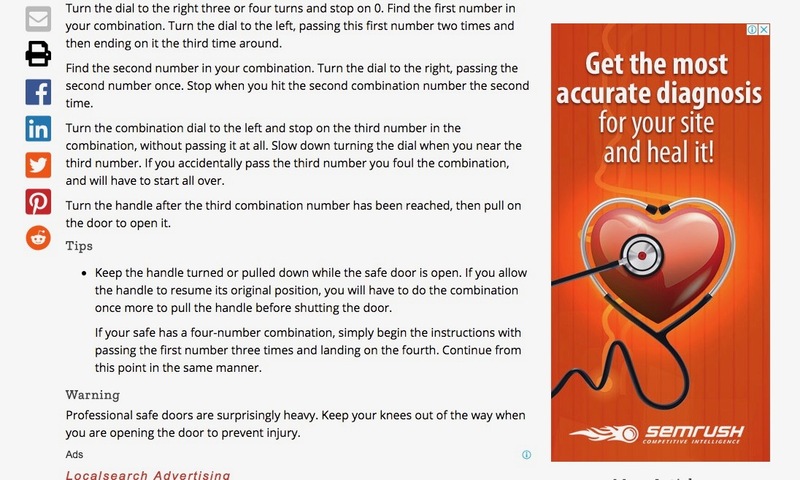 Let’s have a look at Display Ads in action. I recently visited semrush.com, a website for digital marketing professionals (go figure). They’ve taken note of that interaction and displayed one of their Google Display Ads on another website. This serves as a great reminder to go back to their website and continue my purchasing journey. Unlike Search Ads where users are in the active stage of searching, Display Ads appear when people are going about their usual browsing activity. So engagement is usually a lot lower and conversions a bit harder to come by. However, if you have some additional budget to spend on PPC, Display Ads are a great way to increase your brand awareness and keep your business top of mind for relatively little cost. Similar to Display Ads, Video Ads are a great way to increase your brand awareness and keep your business top of mind. If you have video content that engages your target audience, you can choose to display it across Youtube and other video network partners. In most scenarios, Google will charge you each time somebody views your video, so the cost of video ads can run away quickly if you’re not careful with your targeting. Within the video, they’ll be able to click through to your website to continue the buying process. If you already have some great video content and want to increase the visibility of your local brand, Video Ads are worth checking out. Shopping Ads have been around since 2012 and they’ve completely changed the way online retailers leverage paid search. If you’re a local business that sells products online, Shopping Ads can be a great way to increase your sales. 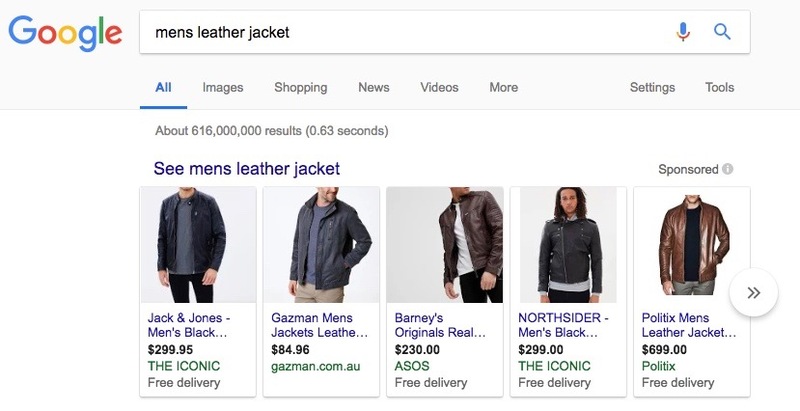 Google only displays shopping ads when it feels that the user is in ‘buying’ mode, meaning that they’re ready to purchase a product. With that strong buyer intent signal, Shopping Ads can achieve strong ROI when they’re supported by a well-built ecommerce website. Here’s what the Google results look like when I searched for ‘mens leather jacket’. The results at the top are paid results from Shopping Ads. Google determined that the query ‘mens leather jacket’ was a strong signal that I was ready to buy one. I quickly decided I’m not cool enough to pull off a leather jacket though. So if you’re a local business that sells products online, Google Shopping Ads are a great way to generate business outside your local area without having to establish a physical location there. 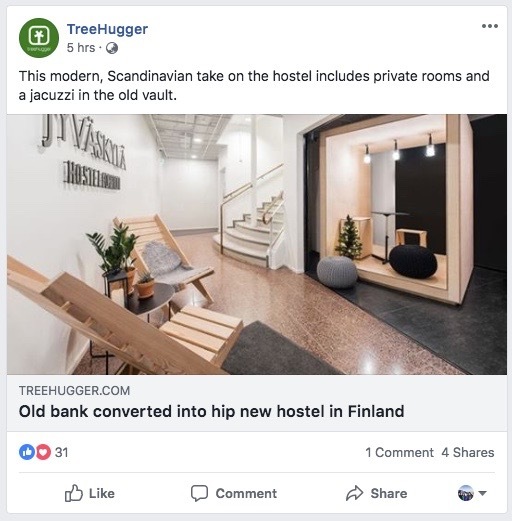 Facebook Ads have been around for about 10 years now and the growth in this ad platform has been massive. With access to incredible amounts of information about individuals across the globe, it’s one of the most powerful paid marketing platforms available today. With such deep user interaction on their platform, Facebook is able to understand us in ways no other company can. You select a goal for your campaign. This could be to generate leads, to drive traffic, or to convert visitors on your website. You create ads to engage that target audience. For every user that logs into Facebook, they’ll identify all of the advertisers that want to reach that user and determine which ads to show based on their auction system. 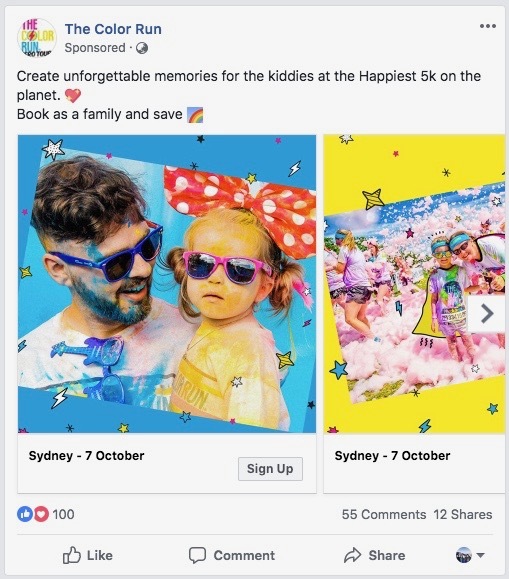 Because Facebook has such rich information about each user, the ability to target users based on demographics, behaviour, and interests is unmatched. Additionally, with the Facebook platform, you’re able to also target users on Instagram as well as Facebook’s Audience Network. Similar to the reach of the Google Display Network, you can reach users across the web using Facebook’s advanced targeting. Google and Facebook are by no means the only paid marketing games in town, but they should be at the top of the list for any local business. Before we move on, I wanted to touch on a few other paid marketing platforms that might be relevant to your local area. There are a number of websites in Australia that allow you to register your business and they’ll send you opportunities to quote or bid for leads that they generate. Websites like HiPages and OneFlare let service professionals create profiles on their websites. They then generate leads for certain services and allow you to purchase leads as they come in, known as Pay-Per-Lead services. Similar to search ads, you’ll be getting people with strong purchase intent, but most of these platforms have competition with other professionals in your space built into the service. They’re built to provide a competitive environment so that customers can compare different providers easily. This means you’ll need to be fast and work hard to close the deal. So Pay-Per-Lead platforms can be a good way to generate new customers, but with any paid marketing initiative, make sure you can measure your ROI to make sound decisions about your investment. There are a number of paid online marketing options available to small and local businesses. The most important thing to remember is that delivering content (e.g. ads, articles, images…) that is relevant to the end user is what drives success on these platforms. Your ability to measure and optimise marketing spend using these paid platforms is difficult to match with any offline activity. We always say, if you can’t measure it, you can’t optimise it. The goal with any Internet marketing is to drive visitors and traffic to your website or business. When we use paid forms of digital marketing, we’re paying a company to show our content to users with the goal of driving traffic to our website and achieve a business goal. With unpaid Internet marketing, the business has to generate content that meets the 1st objective of these online content providers. What’s that 1st objective again? Delivering relevant content to their users. We use the term ‘unpaid’ because the amount of time and effort that’s required to meet this objective can be substantial. So once we’ve generated content that meets this objective, we have to convince the online content provider, e.g. Google, that it’s worth showing. First, we have to understand what makes online content providers tick. Let's use a less complex scenario before we dive into Google. Take your local news website. They want to provide content that resonates with their local community. This includes any local sports, community, or other news that might be relevant to their audience. If you approached them with a story about an adorable dog that was rescued after falling into Throsby Creek, they’d probably love it. But if you approach them with a story about a new accounting business opening up in Sydney, not so much. The same goes for content providers like Google and Facebook. The difference is the complexity with which they determine if a given piece of content is relevant for the user. We’ll start with Google because they’re the biggest search engine in town. This is probably the most common question Internet marketing companies get. 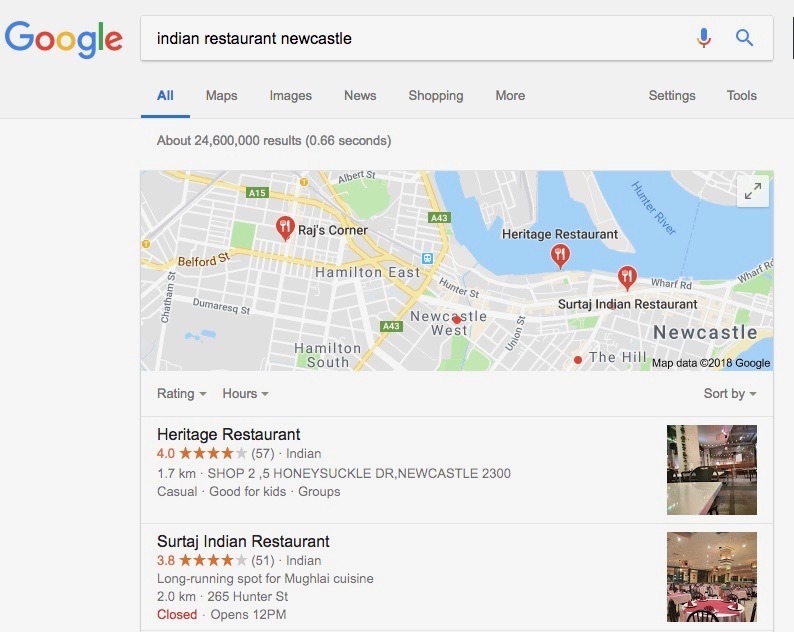 It’s a complex one, but we’ll break down the most important things you need to know to rank your local business within Google’s organic results. The results that appear on a map. Google uses their logic to determine if it makes sense to show the user this kind of result based on their search query. Google uses their logic to determine if localised results are relevant for the search query. They then show the normal text based results we’re all used to clicking that are relevant to the user’s location. So how does Google determine which results to show first out of the 24 million that they found? It’s called Search Engine Optimisation, or SEO. SEO refers to the process of optimising your business’s online presence to appear within the organic (or unpaid) results of a search engine. SEO is a huge topic, but we’ll dive into the most important factors to show up in both styles of Google’s local search results. Google knows a lot about the Internet, and links are really important to them. A link is simply a pointer that directs a user to another location on the Internet. When a user clicks on a link, they’re taken to either another website or another location within the same website. To understand how Google uses link signals, you have to understand how Google knows so much about the Internet. Google has an online bot that crawls hundreds of millions of web pages each day. It captures information about each page, what the page is about (cats, Internet marketing, sports…), and any links that exist on the page…along with tons of other stuff. That allows them to form a complete picture of the Internet. They then use over 200 different signals to determine if a particular page is relevant for each search query. One of their most important signals is links. If there are a lot of links pointing to your website from other websites, Google can infer that the content on your website must be pretty good. Otherwise, why would people be directing their users to it? 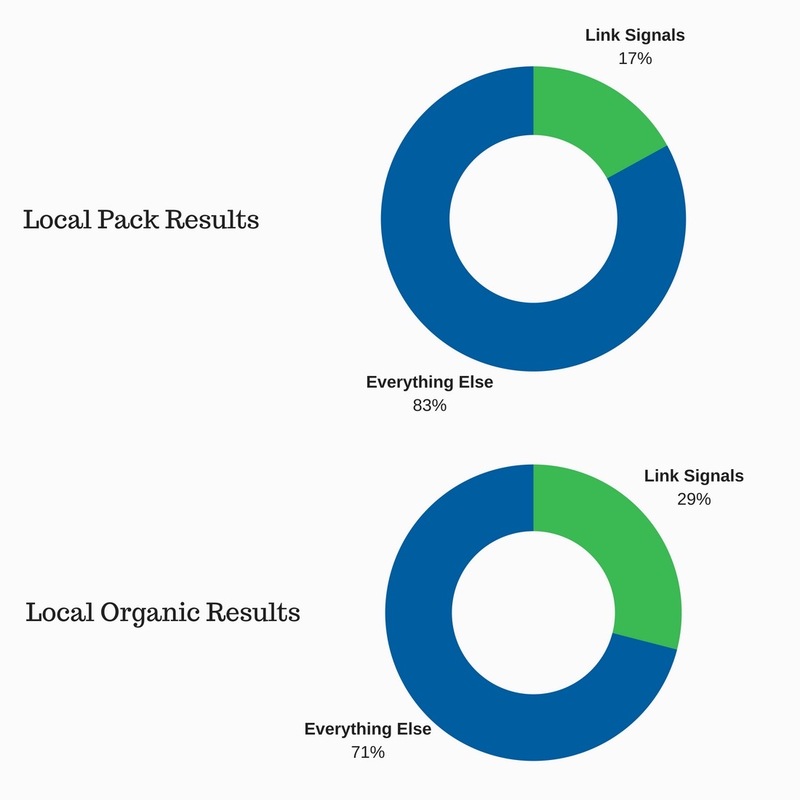 Here’s how important link signals are according to Moz’s study of 2017 local ranking factors. The percentage represents the relative weight Google applies to each type of signal. 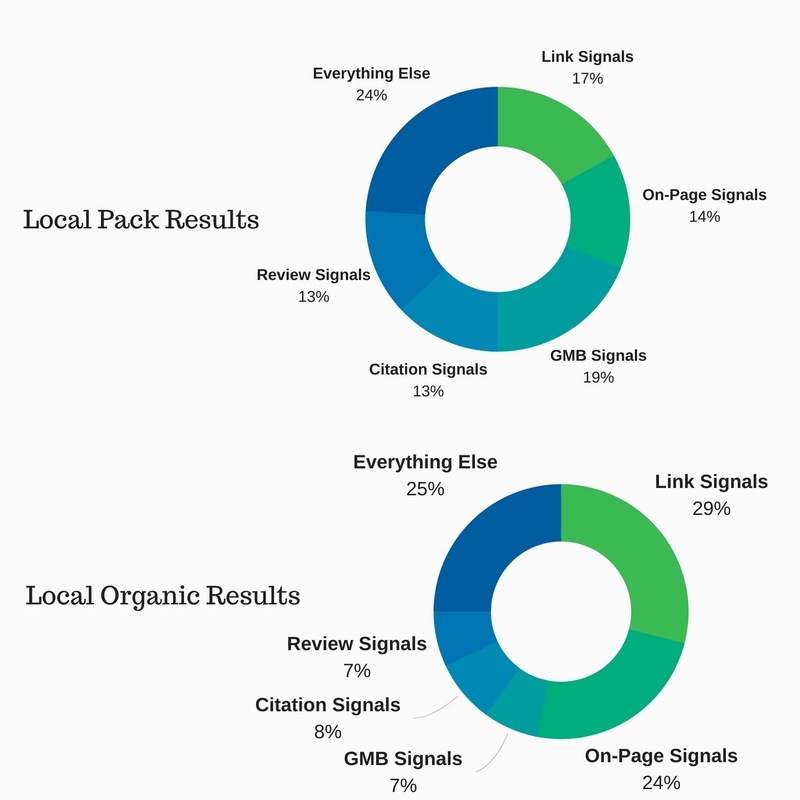 So what can you do to improve the link signals for your website? 1) Make sure your website is registered with relevant local and national business directories. 2) Be involved in your local community and contribute valuable information to businesses and websites that are relevant to your target market. 3) Create great content that other website owners would love to link to. On-page signals refer to the content that you control on your own web page. Things like the title of your page, the description, the images, and other content that exists on your page. Google uses those content signals to determine if your page is relevant to the users search. 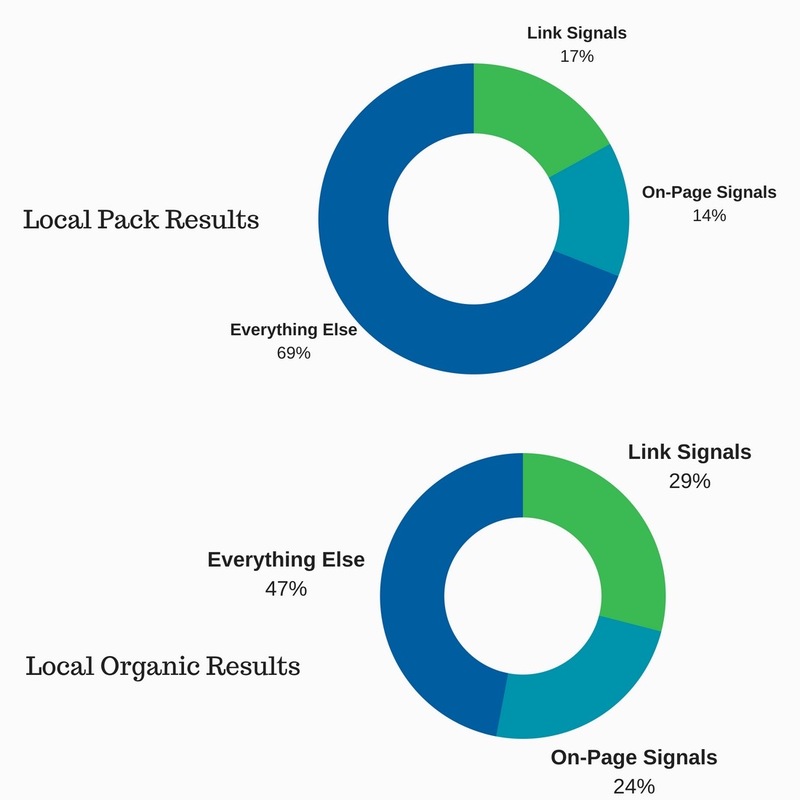 Here’s how important on-page signals are to Google. Google My Business (GMB) is a service that allows local businesses to register their information with Google. They use this information to provide relevant location based results to their users. 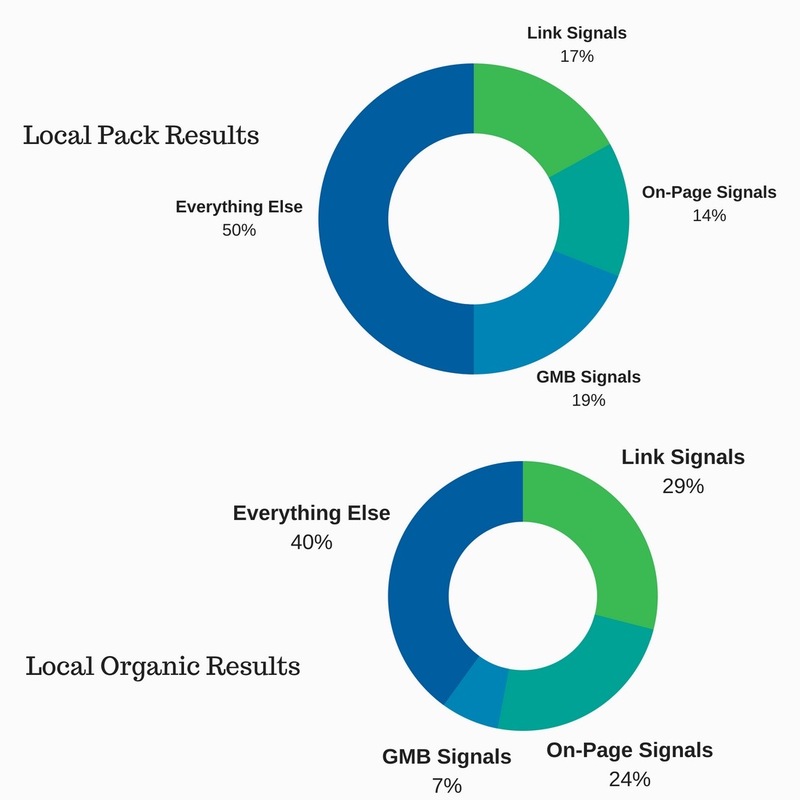 Optimising your GMB page is one of the most important factors when it comes to showing up within Google’s Local Pack results. So if you haven’t created or claimed your listing on Google, do it now! The listing allows you to share what industry your business is in, your opening hours, location, and website, along with other of information that let’s Google and their users know more about your business. Because the Local Pack results usually show up above Google’s organic search results, completing and optimising your Google My Business page is critical for local businesses. A citation signal is simply a mention on another website that includes your business name, address, and phone number (NAP). Google uses this information to further legitimize the accuracy of your business information. The more accurate and consistent the information is the more Google trusts it. There are number of international, national, and local directory websites that are built to make it easy for users to find local businesses. Many of these directories will already list your business information without you even knowing about it. If they identify another directory site has information they don’t, they’ll often create a listing on their site as well, without any involvement from you. That’s why it’s really important to figure out where your business is listed and ensure they have accurate and up-to-date information. 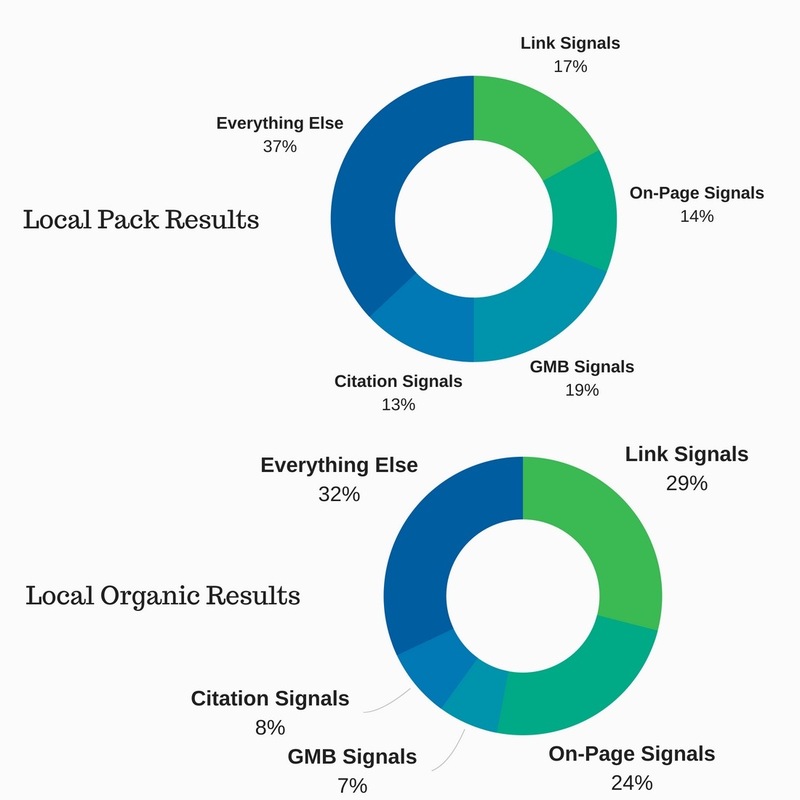 Citation signals play a larger role within the Google Local Pack results, but because it increases the number of websites pointing to yours, citations can also have a positive impact on link signals. We all know that reviews play an important role in acquiring new customers. Research has shown that 92% of customers will use a local business if it has at least a 4 star rating. Google knows this as well, and that’s why reviews play an important role in both Local Pack results and organic search results. Google uses review information from a number of different review platforms, but one of the most important places for Google is your Google My Business page. So make sure you have a system in place that makes it easy for customers to leave reviews, and don’t be afraid to ask for them. If you’re providing a great service, most people will be happy to oblige. Things are changing at Facebook. With the recent crack down on privacy and America’s 2016 election debacle, they’ve set out to refocus on what’s important at Facebook. …and making billions of dollars selling ads! So what does that mean for local businesses? Like Google, Facebook uses a complex algorithm to determine which posts a user sees in their news feed. With so much content being produced and limited space in the news feed, competition is high. Historically, if somebody followed your business on Facebook, they were likely to see any new posts you added to your page. With the latest changes at Facebook, posts that receive genuine and meaningful interaction with users and their friends are taking priority. This means that more consideration will be given to friends and family content that naturally generates lots of comments, likes, and shares and less to business page content. The good news is that you can still work with Facebook’s updates to reach your audience. It just means that you’ll have to be more thoughtful about the posts you create and encourage meaningful interactions. Leveraging unpaid digital marketing strategies to improve the visibility of your local business can provide great returns. But the results are never guaranteed. Algorithms are closely held secrets and they can change at any time, seriously impacting your business. The good news is that the overall strategy of these major content providers is clear. Show content that is relevant and engaging for their users. If you focus on the techniques we outlined above and create content that is relevant and engaging for your audience, your hard work will eventually be rewarded.